Karon Davis, God Bless Preston (2018). Plaster strips, chicken wire, steel armature, glass eyes, stop sign. 66 x 70 x 34 inches. Image courtesy of the artist and Wilding Cran Gallery. Karon Davis plays with the unseen in her sculptures. The figures in Muddy Water, her current exhibition at Wilding Cran, appear as half forms, submerged together in an imagined depth. 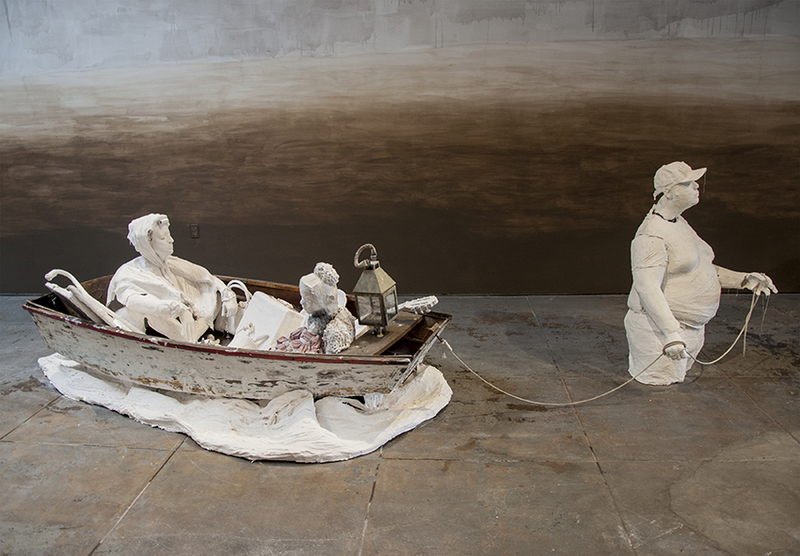 These figures, fragmented and rendered in white plaster and chicken wire, are familiar in their contemporary garb; their story of natural disaster and displacement all too commonplace, recurring through history. Noah and His Ark (all works 2018) recalls the Bible in its title, but depicts a man in a baseball hat pulling his family along in a rickety boat. The effect of the storm seems to have come as a surprise, as the woman in the boat, seemingly ripped from bed, wears both housecoat and curlers. Although static sculptures, these figures convey a struggle for survival—through them, Davis drags viewers into the sluice. We are never quite prepared for the force of water, an element that moves—and displaces—communities, its impact both mighty and violent. The exhibition takes its name from American blues singer Bessie Smith’s recording of a song about the Great Mississippi Flood of 1927, one of the most destructive in American history (sings Smith, “Muddy water ’round my feet/ Muddy water in the street”). Davis, who evacuated her own home in Ojai during the 2017 Thomas fire, adeptly invites us to ruminate on the complex political implications and import of water today and through time—from climate change, to inadequate governmental relief efforts, to the element’s scriptural precedence. She depicts bodies emerging from water in the throes of trauma, some stuck and others slowly trudging on. The hooded young man in God Bless Preston reaches out toward a stop sign for balance, a metaphor for the precarity of survival. In the back room, two little boys perch on a roof in George Bush doesn’t care about black people…and neither does Trump, waiting for aid that may or may not come, given the fickleness of both nature and disaster relief. Despite all of this upset, Davis includes the ancient African water deity Mami Wata, collected and serene amidst the turmoil. Balancing a jug upon her cowry shell adorned head, her presence seems to allude to the grit and tenacity that emerge in moments of utter chaos. Seeing these ancient archetypes pulled into a contemporary dialogue, we are reminded of the continuity of human endurance through struggle. Karon Davis: Muddy Water runs September 16–November 4, 2018 at Wilding Cran (939 S. Santa Fe Ave, Los Angeles, CA 90021). Karon Davis, Muddy Water (2018) (installation view). Image courtesy of the artist and Wilding Cran Gallery. Karon Davis, Beth and Solomon (2018). Plaster strips, chicken wire, steel armature, glass eyes, burlap, 99¢ store earrings, synthetic hair, 53 x 99 x 39 inches. Image courtesy of the artist and Wilding Cran Gallery. Karon Davis, Blue Boy (2018). Plaster strips, chicken wire, steel armature, glass eyes, sand from Siwa (Egypt), 53 x 27 x 27 inches. Image courtesy of the artist and Wilding Cran Gallery. Karon Davis, Noah and his Ark (2018). Wooden row boat, various found objects, Plaster strips, chicken wire, steel armature, glass eyes, 46 x 155 x 50 inches. Image courtesy if the artist and Wilding Cran Gallery. Karon Davis, Mami Wata (2018). Plaster strips, chicken wire, steel armature, glass eyes, cowry shells, Karon’s old weave, tears , 42 x 24 x 36 inches. Image courtesy if the artist and Wilding Cran Gallery.